How do I book an RV? Please submit an inquiry or call us to speak to our outstanding customer service team at (814) 303-9303. If you would like to receive a detailed quote, please indicate the unit and games you are most interested in. Clients must be 25 years old to make a reservation in his/her name and that person must be present during the rental period. Our office is open 6 days a week 8am – 5pm. If we are not available, please leave a message and we will do our best to return your call within 48 hours. We will also do our best to return emails within 48 hours. When can I get a shuttle to State College? Can I lock the RV? Yes, all RVs come with the key inside a combination lockbox. The key remains in the lockbox at all times. What is in the RV's kitchen? Each RV has a full kitchen with refrigerator, stove/oven, microwave, coffee maker with filters, toaster, pots, pans, silverware, dishes, cups, cooking utensils and knives, bottle opener and corkscrew, cutting board, garbage bags, 2 rolls of paper towels, hand pump soap, dish soap, kitchen sponge, spray type cleaner, salt and pepper, sugar and sweetener packets, ice cube trays, grill tools, broom and dustpan. What if I need a kitchen item and cannot locate it in the RV? 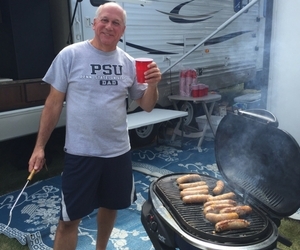 Nittany RV brings lots of extra kitchen items, call the hotline 814-303-9304 and we will check our inventory. What is in the RV's bathroom? Bath towels and hand towels for the rated sleeping capacity, a tub shower or stall shower, a toilet, a sink and mirror, 2-4 rolls of toilet tissue, hand pump soap and shower gel. Is there a sufficient water supply to shower? Yes, each RV comes with sufficient water for everyone to take a ‘Navy’ shower! There is signage in the RV kitchen and bathroom explaining water conservation. There are also on-site showers available at Grange Park, where your RV will be located. Along with your food and clothing, you should bring coolers and ice. The freezer in your RV will hold 2 bags of ice, and we recommend putting 2 bags of ice in this freezer as backup ice. Many clients fill a cooler with ice on Friday evening and keep it in the shade to replenish their other coolers as needed. Most clients also bring bottled water, paper plates, and cups (to minimize cleanup), condiments, a blanket or two for sitting outside on chilly evenings, cards, a tailgate game such as ladder ball or corn hole. What is supplied in my tailgate area? A 5-6 foot outdoor table, a tabletop grill and propane fuel, a long reach lighter and grill tools, chairs for the rated sleeping capacity, a large 30’x 8’ outdoor carpet, a large awning, an outdoor flood light. There is ample room for tailgating fun! Are the RVs close together? Will we have room to tailgate? The open tailgate area is about 40’ x 10’. A table top grill and fuel is standard for each RV, how big is the grill? The Table Top Gas Grill features a 187-square-inch cooking surface, which allows you to cook up to eight hamburgers at one time. Do I have to clean the grill? Where do I park my car(s) and do I need a car parking pass? Each vehicle may purchase a $10 parking pass at the entrance to the Grange Park and park in a car lot across the street from the RV. Can I bring my car into the RV lot to unload my stuff? Yes, you will be able to bring your car up to the RV to unload it and then move it to the parking area. Check in is on Friday from 12PM-10PM. If you are arriving after 10PM, please call the office, 814.303.9303 on the day of arrival to make arrangements. Please broom clean the RV: remove all food from refrigerator and freezer. Wash all dishes, dry them and put them away. Leave sheets blankets, comforters, pillows on unmade beds, and place used towels in the bathtub or shower. Remove all trash and place it outside, close all windows and doors, sweep out the RV with the broom provided and shake the throw rugs, wipe down surfaces with provided spray cleaner. I am checking out before 7am on check out day, what should I do? No problem, make sure you prepare your unit for departure and tell the onsite staff the night before that you will be departing early. What do I do if there is an issue with my RV or I have a question about how something works? Nittany RV provides onsite management who are on duty 24 hours a day making sure all the RV are safe and the systems are operating properly. Please call the hotline at 814-303-9304 for regarding any questions or to request assistance with the RV’s operation. A few of our RV’s allow dogs with a pet service charge, please ask in advance which RVs you should reserve for pets. Can I leave my dog unattended? If you leave your dog in the unit, he/she should be always crated to avoid any accidental damage and to make sure personnel can access the unit. Why is my RV located at Grange Park? 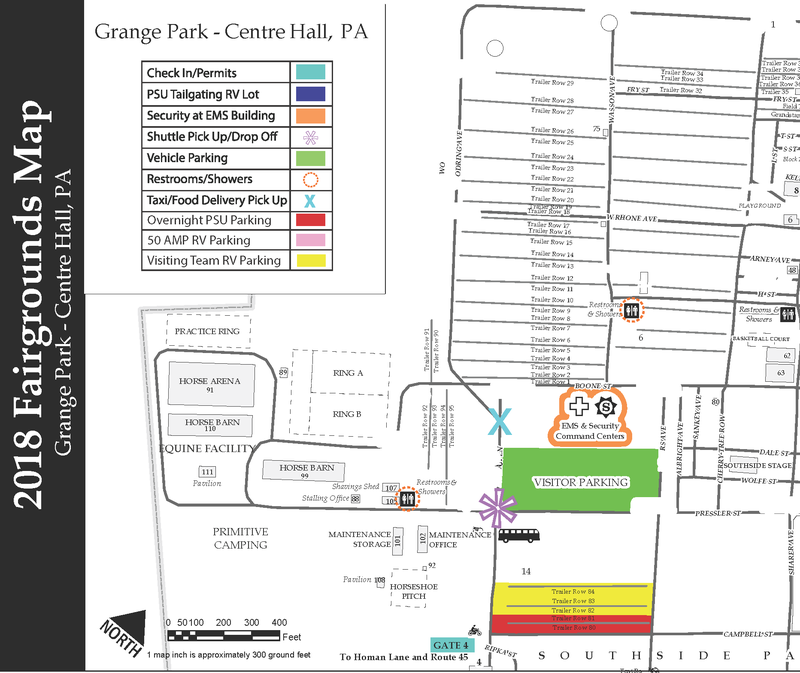 Penn State is directing Overnight RVs to the Satellite Lot located at Grange Park. Grange RV Park is located at 169 Homan Lane, Centre Hall PA. 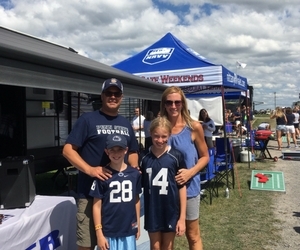 It is approximately 12 miles from Beaver Stadium and will accommodate 1500 RVs and has water, electric hook-ups, flush toilets and showers within easy walking distance from the RVs. Penn State had great success using the Grange Park and running shuttles to the stadium in the past. How do I get to Beaver Stadium? Several options are available. 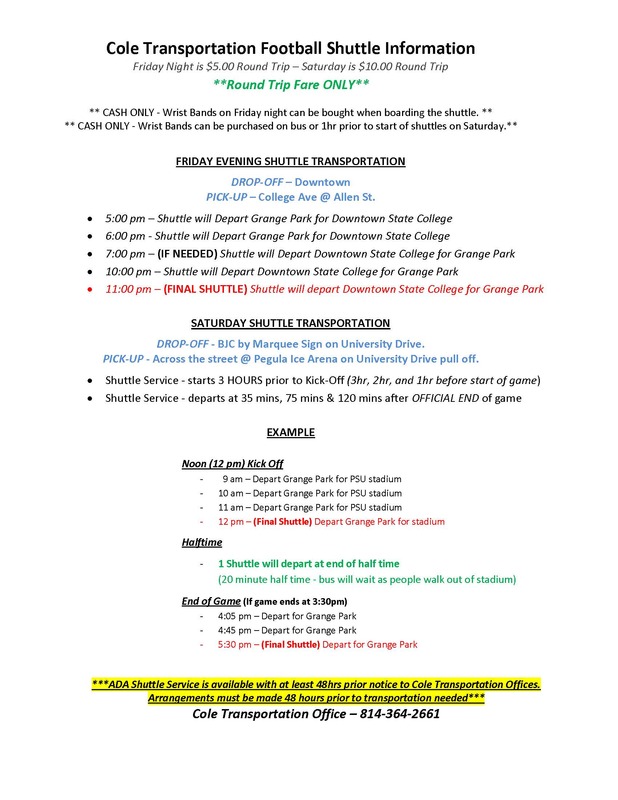 You may choose to drive your car, take a shuttle which a local transportation company will be running pre and post game, use a cab or call an uber. I have a friend coming with his RV, can he park next to us? 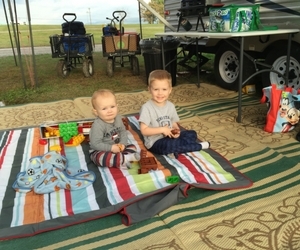 Grange Park is a first come first serve RV park, so we cannot save a spot so you would be side by side. All the RVs in the Grange Park lot are within easy walking distance. 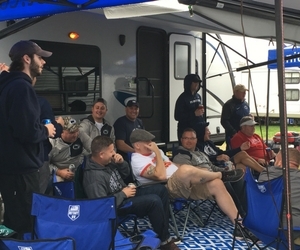 If our group rents 2 RV from Nittany RV can we request they be parked next to each other? Absolutely, unless something unforeseen happens we will honor this request.